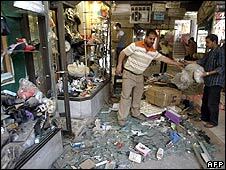 The blast was in a shopping area in Kadhamiya, near the most important shrine for Shia Muslims in the city. A day earlier, nine people died in another bombing in the area. That followed a series of attacks on Monday killing 34, raising fears that violence levels in Iraq may rise again after reaching their lowest since 2003. Police said 23 people were injured in the blast, which tore through a pedestrian-only area filled with jewellery and clothing shops. They told AP news agency the device had been left in a plastic bag. It exploded about 100m (100 yards) from the tomb of Imam Mousa al-Kazim, holy to Shia Muslims. Last January, a man disguised as a woman blew himself up near the shrine, killing more than three dozen people and wounding more than 70. It came a day after Barack Obama made his first visit to Iraq as US president. On an unannounced trip to Baghdad, he said the time had come for Iraqis to "take responsibility for their country". Levels of violence have been generally declining in Iraq but Mr Obama's visit came a day after more than 34 people died in apparently coordinated car bomb attacks in Baghdad. Correspondents say Mr Obama will have used the visit to reassure Iraq's leaders that, when US troops are eventually withdrawn, it will be done responsibly and without plunging the country into chaos.